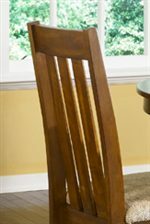 The Upholstered Side Chair consists of slats on the back, straight front legs, baluster stretchers between legs, slightly saber style back legs, and padded upholstered seat. The Urban Mission Upholstered Side Chair by Liberty Furniture at Ryan Furniture in the Havre De Grace, Maryland, Aberdeen, Bel Air North, Churchville area. Product availability may vary. Contact us for the most current availability on this product. Urban Mission Collection represents simple straight lines and sophisticated transitional style. All pieces are made of solid wood and attractive oak veneers beautified in Dark Mission Oak Finish. A modest combination of upholstery, wood, and rustic hardware keep the mission style alive throughout this collection. 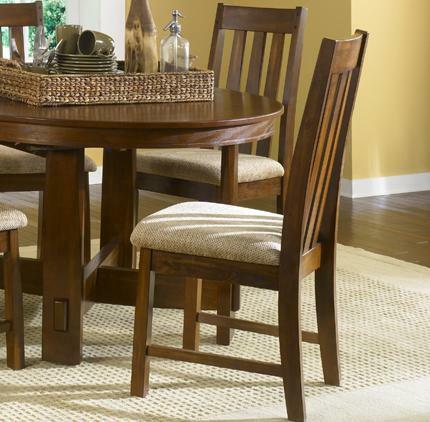 This group of dining furniture effortlessly dresses a room with a modern and inviting aesthetic. Create a personable dining area with pieces from the Urban Mission Collection. The Urban Mission collection is a great option if you are looking for Mission furniture in the Havre De Grace, Maryland, Aberdeen, Bel Air North, Churchville area. 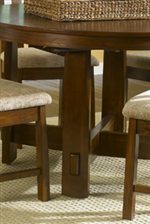 Browse other items in the Urban Mission collection from Ryan Furniture in the Havre De Grace, Maryland, Aberdeen, Bel Air North, Churchville area.